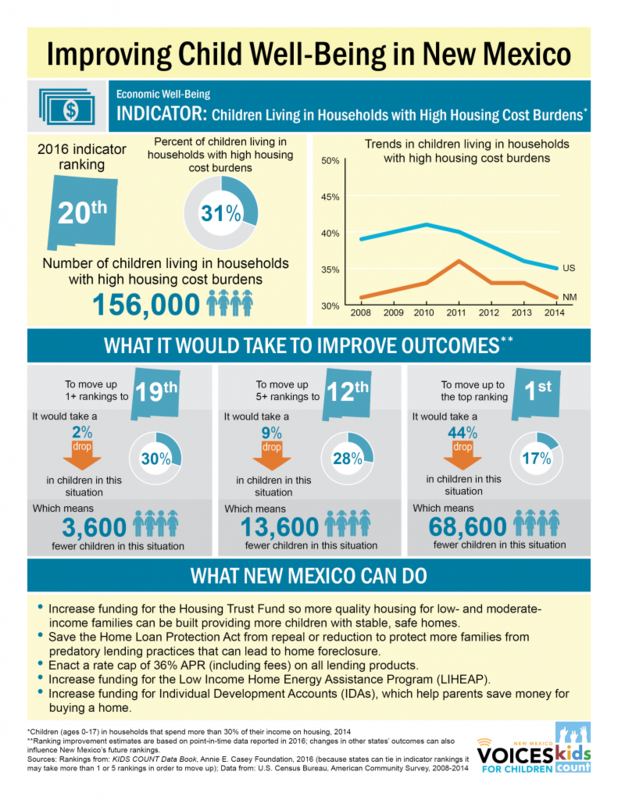 New Mexico Voices for Children is pleased to share an exciting new KIDS COUNT analysis. 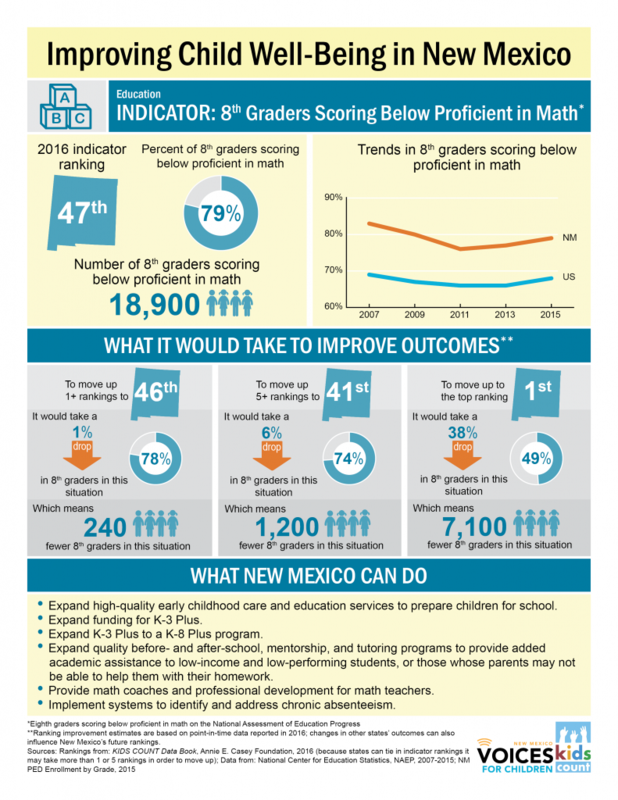 Though New Mexico ranks poorly as compared to other states in the national KIDS COUNT rankings, there are many areas where New Mexico has made progress through policy improvements. 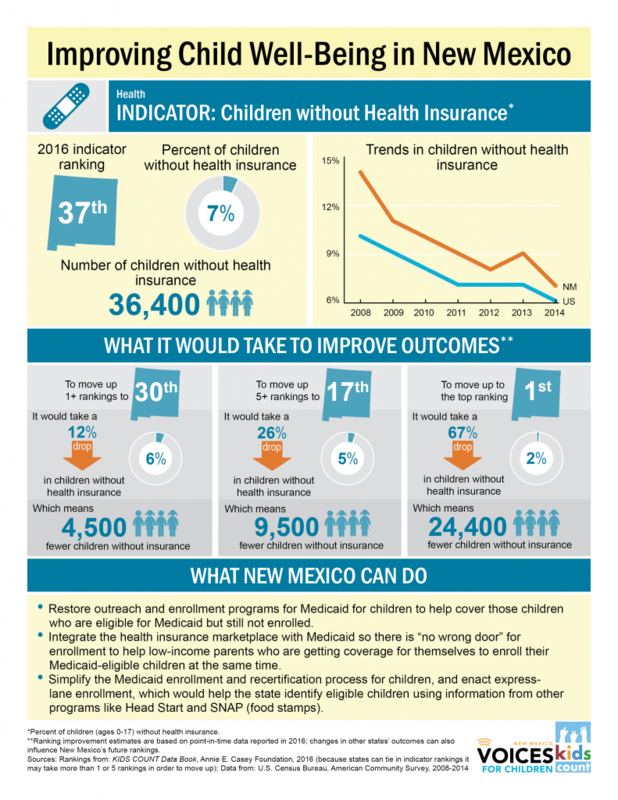 For example, 30,000 more NM kids have health care access due to the expansion of the Affordable Care Act in New Mexico; 5,000 more NM kids have access to pre-K and 3,000 more to state-funded home visiting services than they did in 2010. 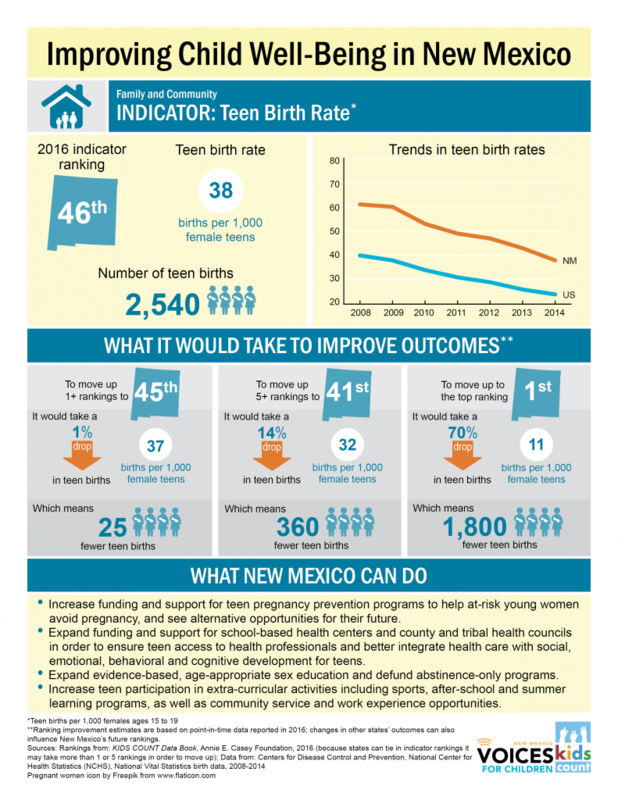 Teen birth rates and teen drug and alcohol abuse rates are also showing significant improvement. There is a long way yet to go, but there are many areas where we’re making progress, and these areas show that we have the power to make positive changes for our kids and that we can do it through policy. With that in mind, and with support from the W.K. 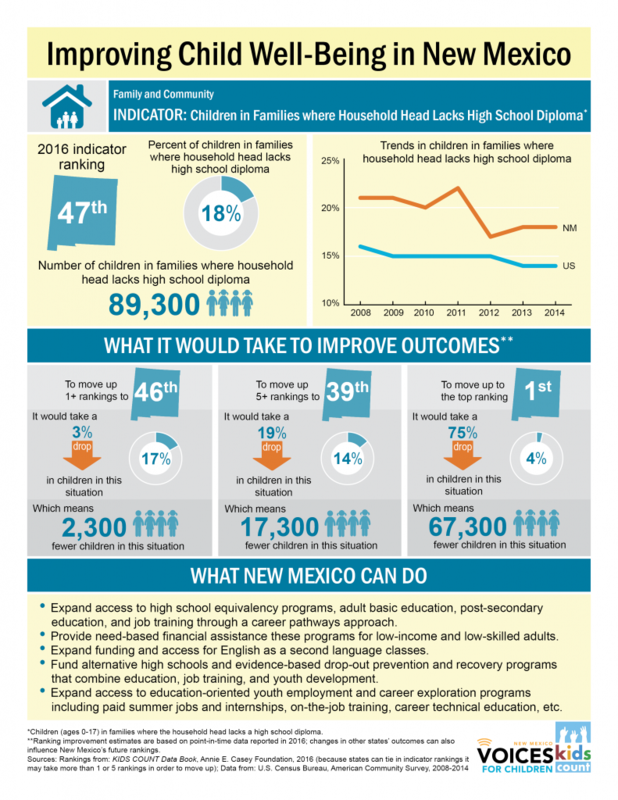 Kellogg Foundation, we researched the potential for positive change in each of the 16 indicators of the KIDS COUNT index with the intent of improving opportunities for New Mexico’s children. We looked at how far away we were from other states on each measure. 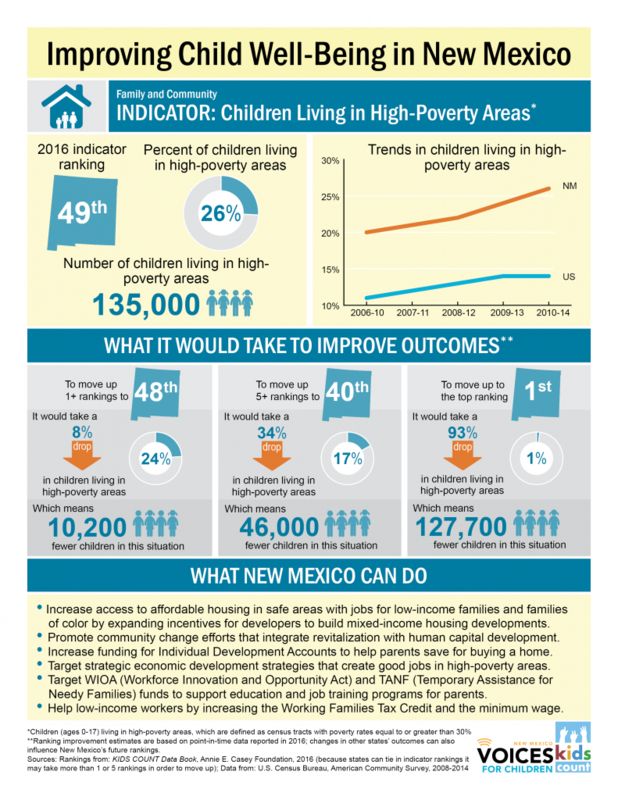 We identified areas where NM has the greatest opportunities for improvement, where positive change was most attainable and accessible, where we were closest to improving not just our indicator rankings, but more importantly, our outcomes, and how we could do it. 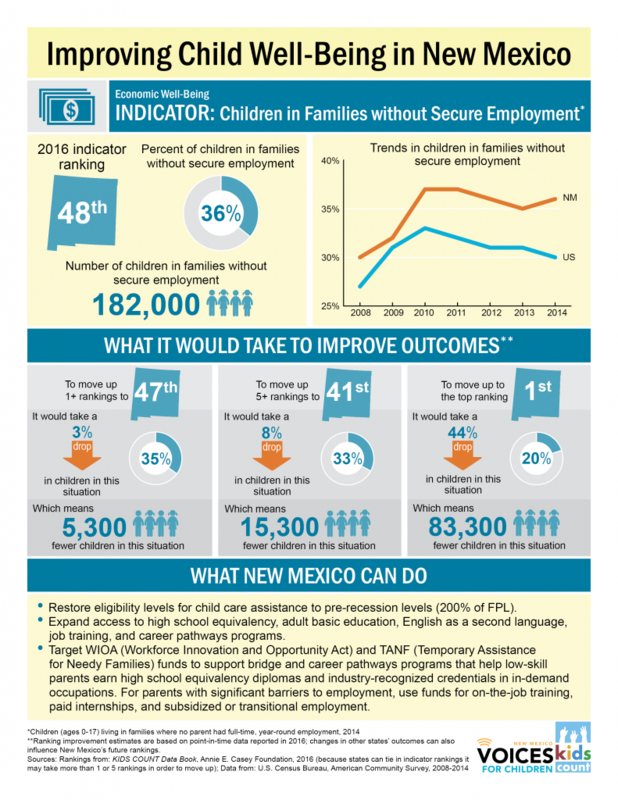 Because each KIDS COUNT indicator is closely linked to long-term family and childhood well-being and opportunity, improving outcomes in even one indicator will benefit vulnerable children and increase their probability for success. 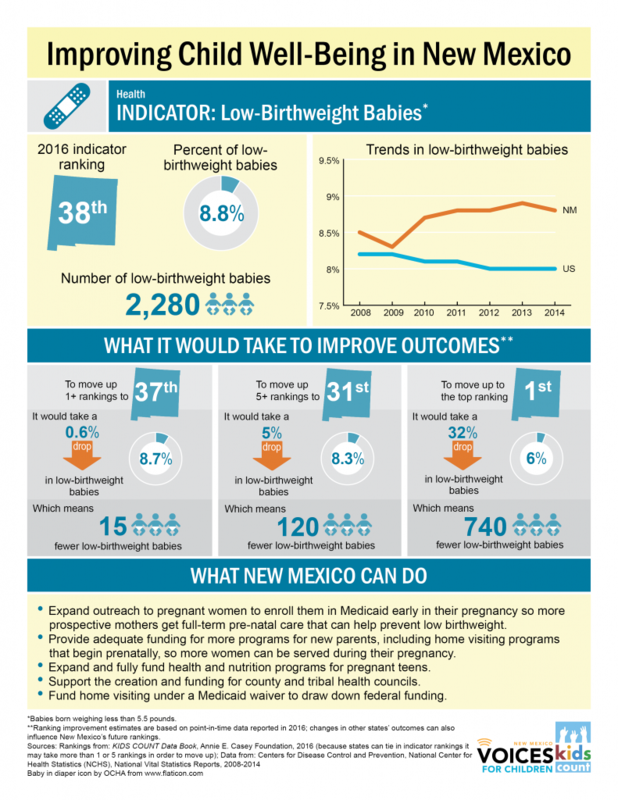 Through the project, the following indicators were identified as the areas where New Mexico has the greatest potential to not only to directly improve outcomes through policy improvements, but also where New Mexico is close to overtaking other states in rankings. 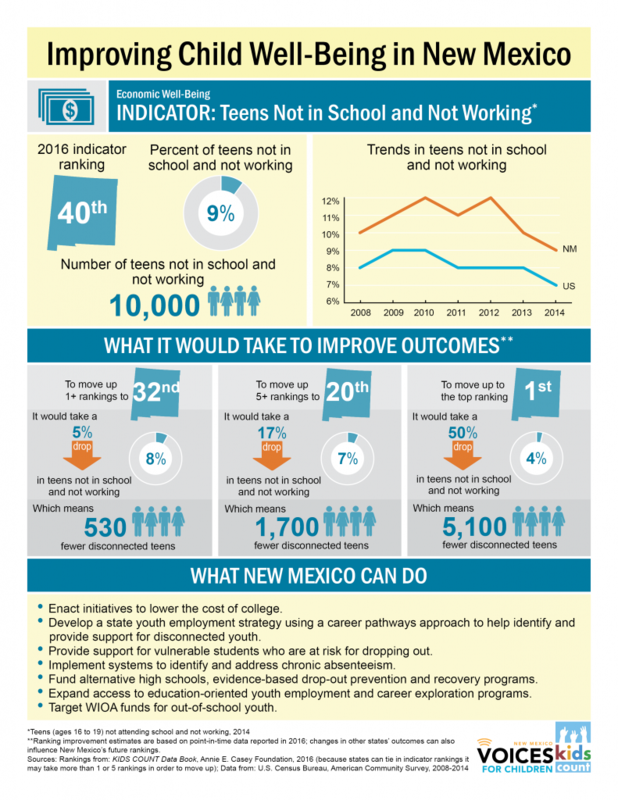 In some of these areas, just a 2 percent change could improve New Mexico’s rankings in that indicator area by five or more spots. 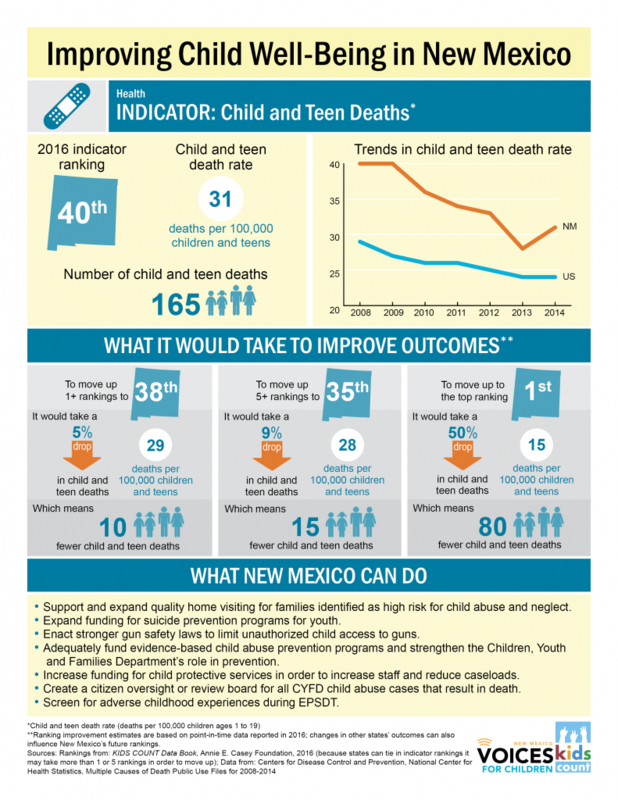 In the following pages, you will find current and historical data on each of the 16 KIDS COUNT indicators as well as analyses of what it would take to improve outcomes and rankings in each indicator. We also include high-leverage and realistic policy recommendations on how to get there. All children should have access to the opportunities and resources they need to reach their full potential. 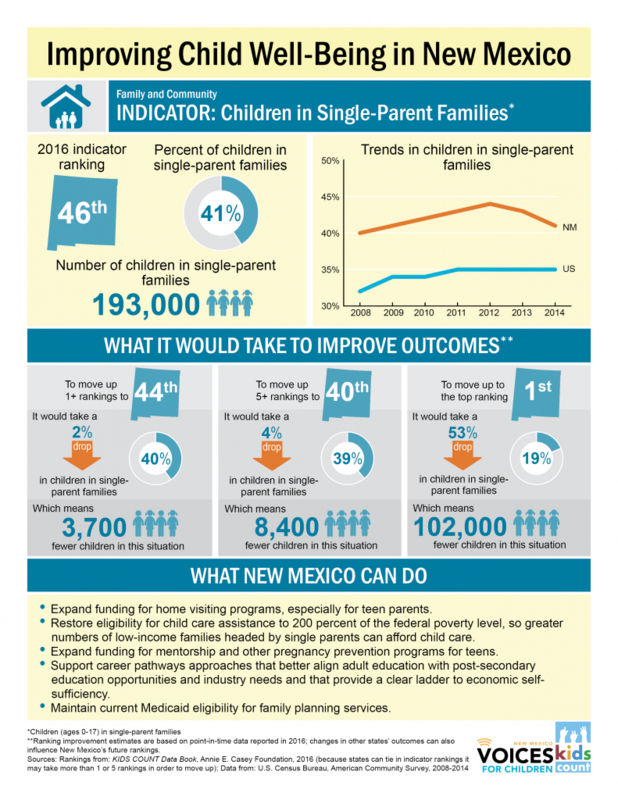 By investing in New Mexico kids and families, we can make our communities, our economy, and our state stronger. 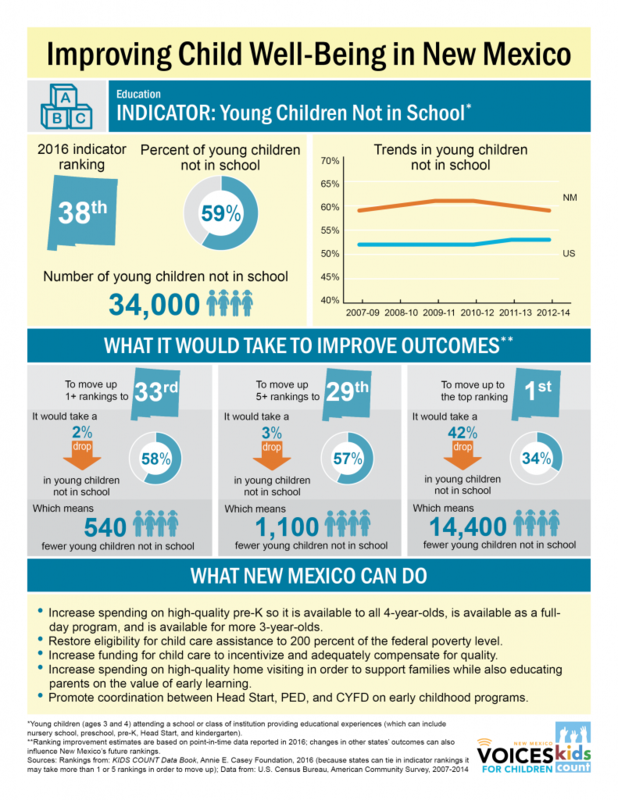 Using data to guide investments in New Mexico kids is the smartest course of action to guarantee our state’s future success. 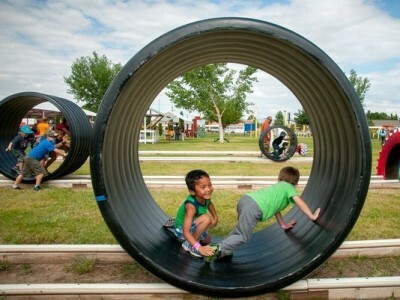 The Annie E. Casey Foundation has been ranking the 50 states on overall child well-being for more than two decades. 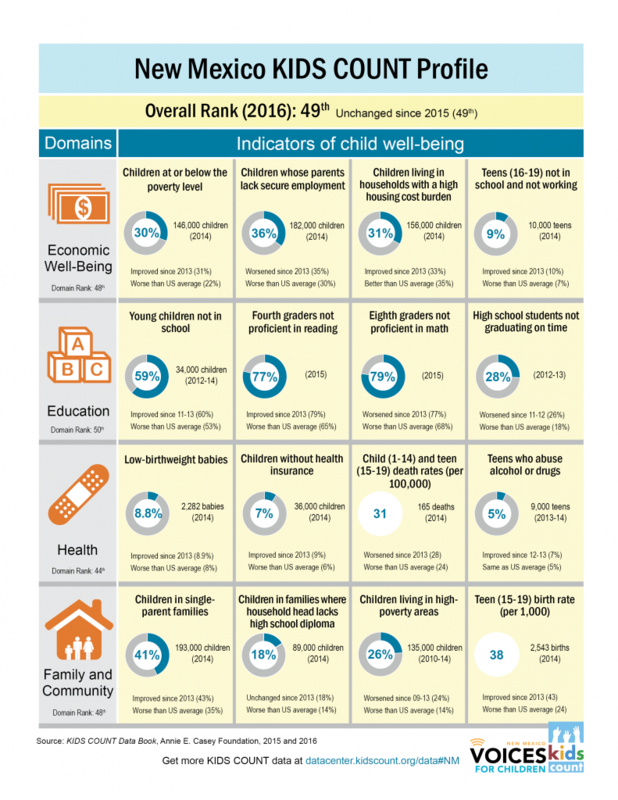 To determine the rankings, the KIDS COUNT program looks at 16 indicators, which are organized under four domains (economic well-being, education, health, and family and community). Each of the indicators—as well as the domains—are ranked. These rakings are then used to determine the states’ overall rankings. However, it’s important to note that while states cannot tie on the overall rankings, they can tie on the indicator rankings. For example, New Mexico’s overall rank for 2016 is 49th. This means that 48 states ranked higher than New Mexico and one ranked worse. Not so with the indicator rankings. For example, New Mexico ranked 5th for the indicator teens who abuse alcohol and drugs in 2016—but so did 29 other states, which all had the same percentage of teens abusing alcohol and drugs. 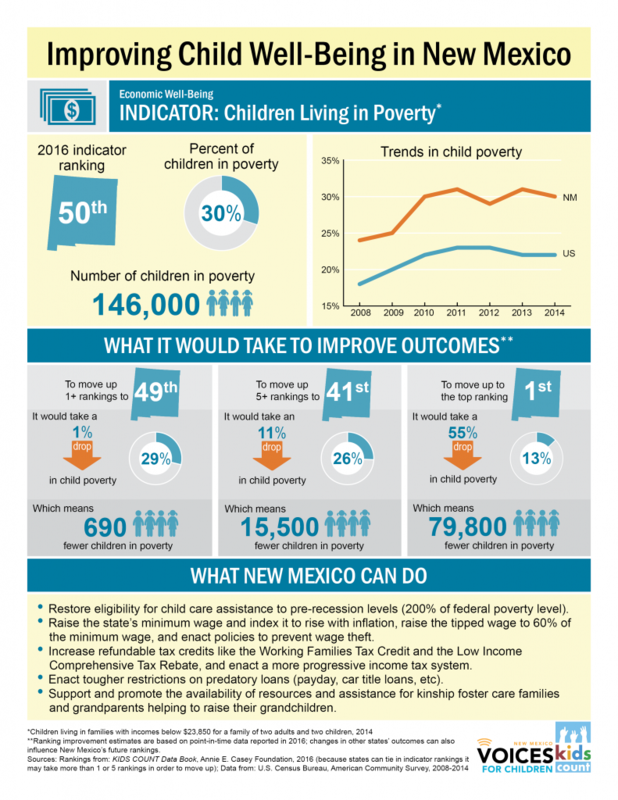 In all, four states tied for 1st on that indicator, 30 states (including New Mexico) tied for 5th, and 16 states tied for 35th. Because states can tie on indicator rankings, a small change in outcomes can mean a much larger jump in terms of ranking. 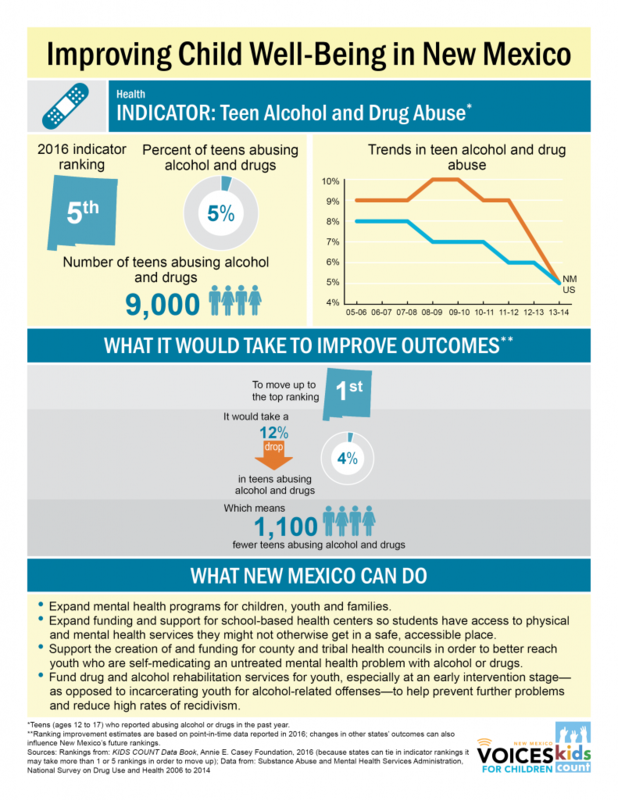 In other words, a small improvement in the percentage of teens who abuse alcohol and drugs could have meant New Mexico was ranked anywhere from 1st to 4th, depending on how many other states did just as well. In addition, New Mexico’s ranking in any given year is the result of more than just how well New Mexico did on that particular indicator that year. It also depends on how well the other 49 states fared. 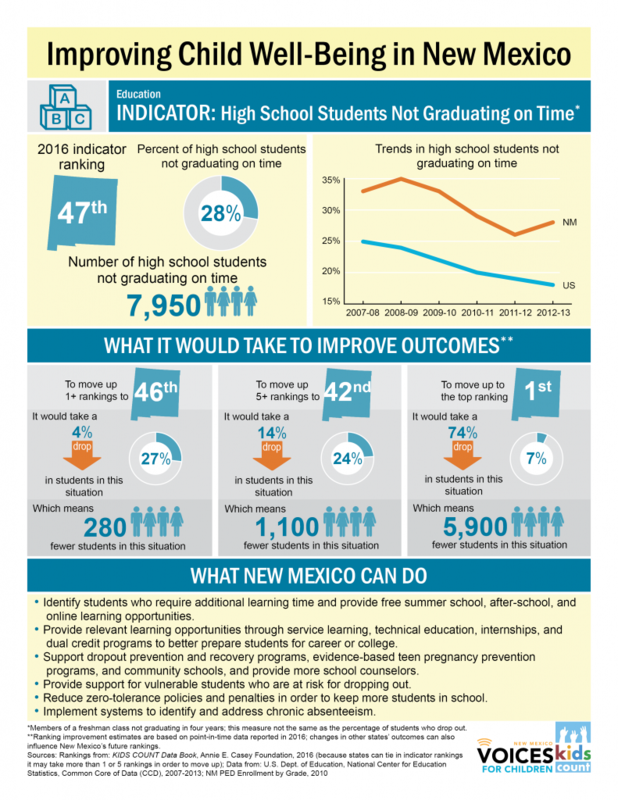 Ranking improvement estimates in this report are based on point-in-time data reported in 2016; changes in other states’ outcomes can also influence New Mexico’s future rankings. A KIDS COUNT special report.